"Mogami cables ROCK! In my studio, it's only Mogami cables because they deliver the best. I can always count on them, from the stage to the recording session — 100% every time!" Teresa Topaz is a Rock 'N' Roll performing and recording artist, composer, and record producer. With her roots in Rock and Blues, Topaz's powerful vocal range meshes with a soulful bluesy grit and her electric guitar hooks, catchy rhythms, and screaming solos have a different feel and timbre on every song. 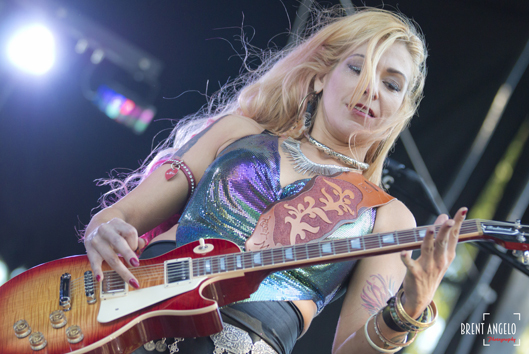 She has been nominated as a Top 5 Best Blues Rock Artist by the Willamette Week, and the Portland Tribune has named her the "Guitar Goddess." On her last album, Reset Me, Topaz composed and performed all the instrument arrangements, and featured a guest appearance with Mr. Keith Waters on bass guitar. She co-produced the album alongside head engineer Tim Biedron, who has worked with Journey, Neal Schon, and Joe Satriani.